A bit delayed, I know, but we're finally coming towards the end of the week... Annafest on Sunday afternoon was both more organised and more civilised. We started earlier – after lunch – and the place was generally less crowded. 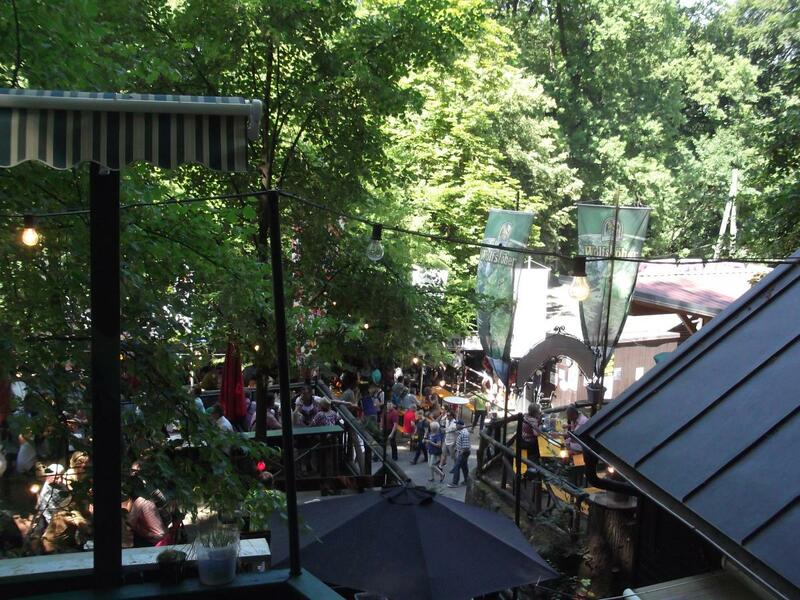 The combination of beer with warm sunshine and green shady trees was sublime. 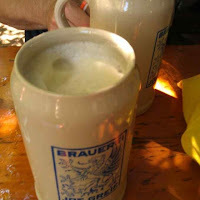 We had the boy with us this time, so we explored the fairground on the way and were also delighted to find that, as well as Bierkellers and lots of food and snack stalls, the woods hold a number of children's playgrounds. We even found a wine-tasting bar, set up to raise money for the local volunteer fire brigade. So when we did move around, it wasn't that hard to find a free table. After starting in the Greif Keller, we moved across the way to Hebendanz which goes up into the woods in a series of terraces and had plenty of room on the upper decks. After a few excursions for food, ice cream and so on, we wandered back down the hill to the Kupfer Keller, which this year it had a special beer on. 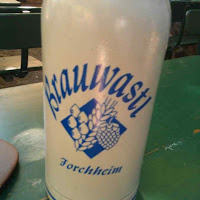 This was Brauwastl Festbier, created by three hobby-brewer friends from the town who then had their recipe commercially brewed by Neder. So how were the beers? A bit samey, I thought. With the exception of the Brauwastl, all were malty quaffing lagers with a varying degrees of sweetness and not a lot of bitterness. Some had light spicy notes and a faint roastiness. I think I'm going to call them Kellermärzens, which is a term I just made up but which I reckon is a good fit. They were also rather expensive – the standard price was €7.40 a litre, plus normally €5 deposit on your Maßkrug. This is in an area where a regular countryside Bierkeller might charge €3.50 or €4 a litre for its Kellerbier, albeit that will not be quite as strong (maybe 4.9% to 5.3% for a typical Kellerbier, versus 5% to 6% for the Festbiers). But these are festival prices, so I suppose we shouldn't be too surprised at them. The best of the five regular Festbiers was the Grief: fuller bodied than the others and with touches of toasted orange and a little more bitterness. Overall though, it was the Brauwastl. Perhaps it was the fact that it wasn't an easy-quaffing Kellermärzen that made it taste notably better, or perhaps it was that it was significantly darker than the others, verging towards a Schwarzbock or a stronger version of Neder's Schwarze Anna, and that I like dark beers.